Welcome to the Weekend Release Roundup, where we highlight what we think are the most interesting movies to hit theaters this weekend. Going to the movies isn’t cheap, so we’re here to help you sort through your choices. What do you get when you put Jim Carrey, Steve Carell, and Jon Stewart into three different films in one week? You get, well…a stirring political drama, a gripping true crime story, and one, yes one, comedy. This week sees the three comedic talents go in drastically different directions with their respective films. Not to be outdone, we have funny man (funny being a relative term) Tommy Lee Jones joining in with a Western drama (remember those? ), and a wild card in an unknown indie feature that shows promise. And if last week hadn’t already served as a reminder, let us clearly state the obvious here: the awards season is here, and the race is getting more crowded every week. The highly anticipated crime drama from Simon and Zeke Hawkins is finally here. What’s that? Never heard of it? Okay, neither have we. But as they say, a stranger is just a friend you haven’t yet met, so let’s get acquainted with this little indie thriller. Starring Mark Pelligrino, Mackenzie Davis, and William Devane, Ban Turn Worse recounts the story of a young man who steals from his boss in order to fund a weekend getaway. This, of course, turns out to be a mistake, when the man and his friends get involved with his boss’s dark and shady criminal cohorts. There’s really not a lot to go by here. The actors are familiar but not well-known, and the directing pair are making their feature debut. The trailer, however, shows some promise and could be a surprise. Oh, 90s nostalgia. If anybody with no prior context were to watch the trailer for Dumb and Dumber To, they’d probably notice an unfunny, uninspired collection of gags and jokes that either fall flat or miss entirely, and then they’d probably never give the film another look. But nostalgia can be a tricky thing, and for most of us who grew up with Harry and Lloyd, we watched the trailer with a hopeful optimism, fighting our own doubts and trying to overlook the obvious problems seeping through the previews. Twenty years after the stupid hilarity of Dumb and Dumber, Jim Carrey, Jeff Daniels, and the Farrelly brothers are back with a film that, if we’re being honest, just doesn’t look very good. And with early reviews pouring in, it seems that we may have a disappointing sequel on our hands, instead of the beloved return we had hoped. The Western may perhaps be one of the more under appreciated genres within the industry in the last few decades. It’s never in high demand, yet when a few or so are released every now and then, it always seems to find and please a solid base audience. Movies like True Grit, Django Unchained, The Assassination of Jesse James by the Coward Robert Ford, No Country for Old Men, and Rango are all some recent examples of crowd-pleasers that were either Westerns or had Western elements to them. Even cult sci-fi gems like Joss Whedon’s Serenity heavily draw on Western tropes. This year, we’re given the Tommy Lee Jones-directed vehicle The Homesman, which tells the story of five people traversing through the Nebraska territories to Iowa, and the harsh conditions and threats they must face to get there. Starring Jones, Hilary Swank, and Meryl Streep, The Homesman is Tommy Lee Jones’ second Western, the first being 2005’s exceptional drama, The Three Burials of Melquiades Estrada. The second of this week’s aforementioned comedic trio, Jon Stewart, directed this real-life account of Maziar Bahari’s four months spent in an Iranian holding center, where he was tortured and interrogated. The film grew from the real life relationship Stewart shares with Bahari (Bahari being a frequent guest on Stewart’s The Daily Show), and the trailer shows a very conscious and respectful handling of the material that Stewart has been entrusted with by his friend, who’s played by the talented Gael Garcia Bernal. Not to be overlooked is the involvement of Kim Bodina, a spectacular Danish talent portraying Bahari’s chief interrogator and tormenter. The film, far from a comedy, still seems very in tune with what we know about its director in that it is topical, political, and seems to profess and call for some sort of social change. 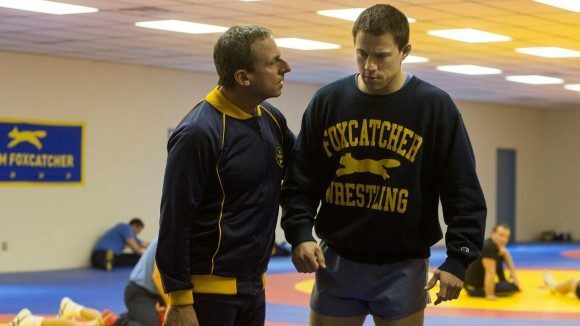 Foxcatcher has an interesting pre-release backstory to add to its compelling plot and list of talent. The film was originally slated to come out a year ago, but was pushed back for what was then described as an opportunity to allow director Bennett Miller (Moneyball) more time to finish the film. For anybody who continuously follows the trade papers, that usually means imminent disaster for a film. The pushback of a major release, oftentimes a film thought to be an awards contender, is quite common among Hollywood and can indicate a studio’s waning confidence in a project. It has happened to films like The Soloist, The Monuments Men, and Shutter Island, and more often than not it spells trouble for the film. For Foxcatcher however, it seems the pushback served the project well. It ended up making its world premiere at this year’s Cannes Film Festival, where it got rave reviews, winning a best director award for Miller. That buzz has been following the film ever since, and early reviews this week prove that waiting a year was the right call for distributor Sony Pictures Classics. The film is a true crime saga of an Olympic Wrestler who tries to get out from his older brother’s large shadow by enlisting the help John du Pont, a deeply disturbed man who drives the wrestler to his breaking point. The film stars Steve Carell, Channing Tatum, and Mark Ruffalo, and while all three men are said to deliver exceptional performances, the attention is squarely focused on Carell here, who looks unrecognizable as the troubled du Pont.